You’re going to have a baby! Congratulations! But one thing you may not think belongs on the “fun” list is the actual process of getting the baby out of your womb and into the world. While perhaps not “fun,” having a baby is precious, and it’s an experience you remember just as much as that day you walked down the aisle. For moms who have had a disappointing delivery in the past: As you consider your coming birth, you may find you need continued healing from your prior birth(s). This article may be helpful for you. Because it’s a day you will remember forever, consider planning your birth with the same care you would plan your wedding day. Put a lot of thought into your decisions about your birth and make sure you’re happy with it and it suits you! A big part of making your birth a positive one is deciding on the right birth provider for you. Choosing a birth provider is not like picking your favors and chair covers, people. It’s more like choosing your wedding coordinator, venue, and bridal party. Do you want a casual summer backyard picnic? Formal winter ball? When planning a wedding, you need to cast a vision before you can decide on centerpieces and invitations! Likewise, it’s silly to think you can make other decisions about your birth before you’ve done your research and thought about what you want in a birth. But so often that is what we do! By default (at least it was for my first birth experience), we think: first step: find a provider. But how can you choose the right provider if you don’t know what you are looking for in your birth experience? Dream a little with me now. Besides a healthy mom & baby, what are your main objectives? Avoiding major surgery (c-section) if at all possible? A water birth at home? Being involved in the decision-making during labor & delivery? Under what circumstances would you want/be ok with a c-section? Epidural? Episiotomy? Other? Why? How many weeks would you want to let your pregnancy go before being induced? Why? Do you want an epidural, other pain relief options, or a completely natural birth? Why? Do you want to be a big part of the decision-making process or would you rather just rely on your provider’s expertise? Why? If you don’t know the answers to these types of questions, that’s ok! It’s a good idea to take some time to research these kinds of things before you settle in on a provider. Knowing where you are at with your birth preferences can help you in making that decision! Now that you’ve decided on that super-casual beach wedding, you know that volleyball and hot dogs are fair game. You also know that those elaborate silver invitations will not set the right tone, and princess ball gowns would seriously interfere with volleyball. So now you can get down to the nitty-gritty: choosing your wedding coordinator er, birth provider can make all the difference! Be sure you decide on someone (or a group) who is on board with the vision you’ve cast and won’t try to turn your beach party into a black tie affair. Let’s look at two of the most popular options: Obstetrician/Gynecologist vs. Midwife. For moms who have had a previous c-section: Deciding on a repeat c-section (RCS) vs. vaginal birth after cesarean (VBAC) is crucial as you choose your provider. Many providers will opt for a RCS because of the potential risks of a VBAC. However, if you so desire one, be encouraged that the American Congress of Obstetricians and Gynecologists (ACOG) recommends VBACs as a perfectly safe and reasonable option in most cases. This list is a helpful resource in finding a VBAC-supportive provider. If you opt for a RCS, you may want to research gentle c-sections for some ideas on how to make the operation more like a natural birth experience for both mom and baby. Both OB/GYN doctors and midwives are covered by most insurance providers. They stand prepared for emergencies and have a plan for what to do in these situations. Also, research has shown shown equally good fetal and maternal outcomes when comparing OB/GYN and midwife births. Ladies, there’s no need to rush your decision about your birth provider. It’s better to wait a few weeks and feel confident in your decision than to hurry to choose someone. Along those lines, it’s never too far along in a pregnancy to change providers if you no longer feel comfortable with yours. Even if you’re 35 weeks along, if she’s not on board for your birthing requests, she may not be right for you. Take the time you need to interview a few different providers, if you’d like. Come in knowing what you’re looking for and see if the provider you are interviewing is on board. Write down what they say somewhere—such as this journal. For example: Ask what the provider’s c-section rate is (national average is 32.8%). If desired, find the provider with the lowest one (World Health Organization considers the ideal c-section rate to be between 10-15%). Ask some questions that are important to you. If they don’t give you a direct answer to an essential question, they say “let’s cross that bridge when we get to it,” or you just don’t feel taken seriously, it may be a good time to move on. The questions you ask are totally up to you! Maybe you have lots of questions, or maybe you don’t have many questions because you’d rather minimize decision-making and trust that the expert knows best. At how many weeks would you recommend inducing labor? Can you tell me more about your decision-making process when things come up during labor? What interventions do you routinely use? In the end, see who you “jive” with most—not only on a personality level, but also on a birth philosophy level. Whatever you decide, make sure you feel comfortable with your provider, listened to, and confident he/she will be on the same page with you about what decisions should be made when. Remember: Just as weddings rarely go as planned, births rarely happen the way you are expecting. Choosing the perfect provider does not necessarily mean you will have the “perfect” birth. That’s why making a birth plan and choosing the right provider is important! When you are having your baby, you will want to know that the person you’ve chosen to call the shots is making the same decisions you would if things don’t go according to plan. And remember, labor and delivery are just the beginning of a whole new adventure. As with marriage, you’ll be adding another person to your family to have and to hold, to love and to cherish, till death do you part. I realize there’s a lot of information in this article, so I have created a free checklist to print and take with you as move ahead with this life-changing event! 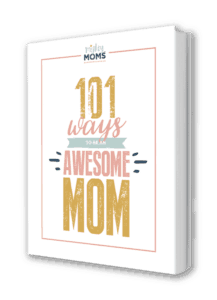 Simply fill out the form on this page and you’ll receive the checklist emailed to you, along with a complimentary weekly subscription to MightyMoms – getting you ready for the next five years of motherly adventure! Just as there are ideal venues for certain types of weddings, there are ideal locations for certain types of births. Often, your provider choice and birth location choice go hand-in-hand. Most OB doctors will only deliver in hospitals. Midwives can deliver at home, hospital, or birth center (depending on the midwife). More personnel coming in and out to assist with procedures, take blood pressure regularly, etc. The location of your birth can set the mood and tone of your birth experience, and there are many factors to consider. Take the time you need to choose the place that’s right for your birthing experience. We’re making great progress planning this wedding! Now it’s time to choose the bridal party—or, in our case, birth attendants. Who would you like helping you prepare in the nine months leading up to your birth (besides your doctor/midwife)? Who would you most like to have at your side during your labor (besides your doctor/midwife)? There are many professionals who can assist you during pregnancy and labor. I could say so much about each of them! Acupuncturist/Acupressurist – Acupuncture has been shown to help relieve pregnancy troubles such as morning sickness, pelvic pain, and sleeping problems. Childbirth Educator – Childbirth education can come in many forms. Classes can be focused more on the medical aspects of childbirth or on pain management/breathing/etc. Most hospitals offer childbirth classes to expectant moms, or if you need something more flexible, Kopa Childbirth has an excellent natural childbirth course online. Doula – Literally a Greek word meaning women’s servant. A doula is there to assist you as you prepare for labor as well as during your labor and delivery. Many studies have proven the benefits of having a doula present during pregnancy as well as labor. Massage Therapist – Massage therapy during pregnancy can improve labor outcomes and newborn health. Having some of these people available to help you may cost some extra money. But, like your wedding day, it may be worth the extra investment to make it a more positive experience. Many women choose to have their man with them during labor. My hubby was an amazing help and support during my labor and delivery experience! Make sure to take some time to sit down with him to get on the same page about what you each expect and what type of role he should play. You may also want to consider having him come to a few prenatal appointments/childbirth classes/doula meetings/etc., so he can gain a better understanding of what to expect. Anesthesiologist – Typically, the anesthesiologist on call will be involved if you have an epidural or other anesthesia during labor. Family – Are there any family members you’d like to have there? Or, do you feel having other family (siblings, parents, etc.) there would be a distraction/hindrance to your labor? Make sure to tell them what you want them to do when baby time comes! Would you love to have your mom by your side through your entire labor? Ask her to be there! Think labor will be better with fewer people present? You may want to consider politely requesting beforehand that all extended family members refrain from coming to meet the baby until notified. Nurse(s) – Typically you will be assigned a nurse if you deliver at the hospital. However, you can request a different nurse if the one you have is not a good fit! Or you can explain when you arrive what you are looking for in a nurse so they can assign one accordingly. Student(s) – Sometimes, student midwives/doctors/nurses are invited to be present. If you have preferences about whether you want a student present at your delivery, let your provider know. The people you have by your side on that special day can make all the difference. We don’t want any embarrassing Maid of Honor speeches or attention-stealing bridesmaids at this party! So, you’ve made all your wedding plans. Everything is in place. All the people involved know what to do when. Whatever provider, location, and attendants you choose, just make sure it’s what’s best for you and your baby! Set yourself up with the people and setting you want, and then trust in the arrangements you’ve put in place, let it go, and stay flexible. Remember: When the big day is finally here, things may not go as planned. So, keep perspective. Just as a wedding day is only the beginning of a marriage, giving birth is only the beginning of a brand-new, life-changing parenting adventure!